Elyse Barletta, 27, works full-time as a nanny in Charlotte, N.C., taking care of nine-month-old Reynolds Norman. 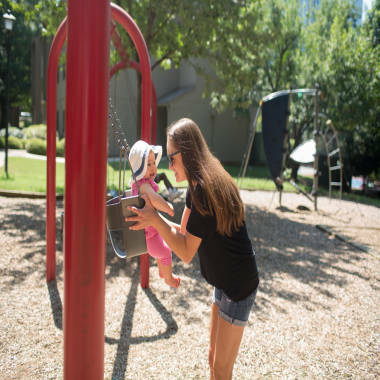 When American University graduate Elyse Barletta, 27, was looking for a full-time nannying position recently in Charlotte, N.C., three families wanted to hire her — all were impressed by her college education. “They wanted someone who could help with their children’s homework,” said Barletta, a history major who made the Dean’s list and is proficient in French. Cliff Greenhouse, president of the Pavilion Agency, which helps New Yorkers find household staff, has noticed a shift toward nannies like Barletta since the mid-1990s, when he saw very few Americans in the industry and fewer college-educated applicants. He attributes the change to the growth of working mothers, with many women becoming the breadwinners of their families. Barletta, a former history major, says her job nannying for nine-month-old Reynolds is personally rewarding. “Moms [who use our agency] aren’t going to work full-time unless they can leave their children in the care of someone they consider a peer,” he said. Becky Kavanagh, co-president of the non-profit International Nanny Association, has also observed this trend, especially among professional couples in larger metropolitan areas. “They’re looking into the total education of their child,” she said, adding that many couples seek out nannies who have degrees in early-childhood education as well as nannying experience. For some parents, the ultimate nanny candidate has multiple degrees, including Master’s degrees. “They see that and say, ‘Oh my gosh, I have to have that,’” she said. Experts say they have seen a rise in highly-educated applicants at nanny agencies since the Great Recession. When Natalie Gibbs, 27, started nannying for a family in Hinsdale, Ill., about two months ago, her college degree was of great interest to her new clients. “They were willing to pay a bit more for an educated nanny,” said Gibbs, who was an applied science major. In many places across the country, some families are so eager for well-educated nannies, they’re paying them salaries comparable to entry-level finance careers. Despite the hefty price tag, some families see a well-credentialed nanny as a wise investment -- and even a way to save money on tutoring fees. Former history major Barletta says of nannying, "I have patience for kids. I love it." Donna Walrond, a Brooklyn, N.Y., mom of three boys, employs a full-time nanny who didn’t go to college, but recently hired a second nanny, Samantha, who has a bachelor’s degree and is fluent in Hebrew, to tutor her two elementary-school aged sons during the school year. Spear, who has a degree in human development with a focus on early childhood education, believes that her schooling was a huge asset when applying for her job. “I think that really comforted [my employer]. Whether it’s a physical ailment or a learning disability, I know how to recognize these things and help [the children] develop,” said Spear, who helped her 17-month-old charge Lucy learn how to walk two months ago. Spear eventually wants to start her own nanny placement agency, but hopes to stay with her current family for another five years or so. She believes her highly-specialized education is crucial for anyone considering her field.